Desperately endangered, sharks may become extinct in the near future if current fishing practices persist, and their loss would be devastating to marine ecosystems. Despite their reputation as man eaters, the reality is that approximately 10 people worldwide die from shark attacks on average each year according to Barry Tobin of the Australian Institute of Marine Science. In fact, more people die in vending-machine-related mishaps than are killed by sharks. Shark finning is a multi-billion dollar industry, with a single pound of dried fin retailing for more than $300. The fins are used to make shark fin soup and traditional medicines. In some cases sharks are also killed to make shark’s tooth jewellery, belts, wallets, and cosmetic products. In addition, shark cartilage has been sold as an ineffective cure for cancer. There is absolutely no scientific evidence that shark products provide any medicinal benefits to humans. Shark fin soup can cost up to $400 per bowl. The shark fin doesn’t even add any flavour to the soup; it is actually flavoured with other types of meat. Although shark fin soup is sold widely in Asia where it is considered a prestige product, the name translates to “fish wing soup” and so many consumers don’t know that it contains shark, or that the industry supports cruel and ecologically dangerous practices. Each year 100-200 million sharks of all species and ages are killed for their fins. After their fins have been sliced off, live sharks are tossed back into the ocean where, unable to swim, they sink to the bottom. A finned shark can take days to die and will either bleed to death or be eaten alive by other animals. Sharks are not the only victims of the finning industry. Some shark finners cut up dolphins to use as shark bait, and dolphins, whales, albatrosses, and turtles are caught in the longline nets used for shark fishing. Because of finning, experts have estimated that the majority of shark species, which have been around for more than 400 million years, will become extinct within a decade. Removal of a top predator could destabilize marine ecosystems, as well as removing a needed food staple for those in developing countries. With finning, nearly all of the shark is thrown back into the ocean, while people who rely on shark meat for sustenance are deprived of needed protein. In addition, the finning industry is controlled by criminal interests and threatens sustainable, traditional fishing operations. Sharks are vitally important to marine ecosystems because they remove diseased animals and maintain the ocean’s balance of predators and prey. Marine ecosystems are critical to human life, and it is not yet known what the full impact of the loss of sharks might be for humans, but there are some early indications of impending widespread disaster. Some shark species have had their populations reduced by up to 95%, and in certain places this imbalance is already threatening sustainable industry. For example, the loss of sharks has led to an explosion in the octopus population, and because octopuses prey on lobsters, Tasmania’s lobster fishery has collapsed. Other such trickle-down effects are being felt in a variety of locations, endangering the livelihoods of those in many sustainable fishing communities. What is the likelihood of being killed by a shark compared to other dangers such as lightning strikes or firecracker accidents? See Sharks Rarely Attack for statistical comparisons. 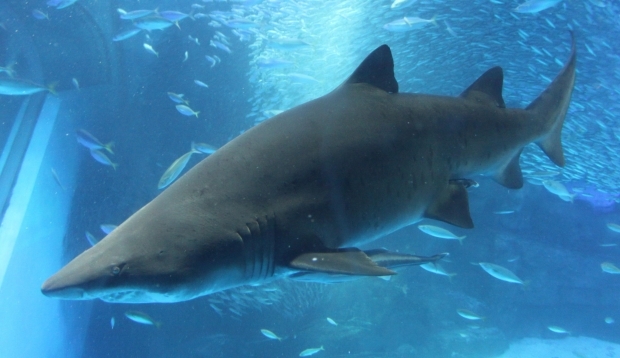 Although shark attacks are very uncommon, there are ways to further diminish the risk. See How to Reduce the Risk of Shark Attacks for tips on avoiding danger. See Sharkwater.com and SeaShepherd.org for information on shark finning and how to save sharks. For a full list of shark articles and resources, see the main Sharks page. AdoptaShark.com. (2009). “FAQ.” Iemanya Oceanica. Benchley, Peter. (1995). “Misunderstood Monsters.” Smithsonian Institute, SharkFriends.com. Burgess, George H., International Shark Attack File, Florida Museum of Natural History, University of Florida. (n.d.). “Reducing the Risk of a Shark Encounter: Advice to Aquatic Recreationists” and “How, When, & Where Sharks Attack.” FLMNH.UFL.edu. Florida Museum of Natural History, University of Florida, Shark Attack File. (1991). “Shark Attacks in Perspective.” [Reprinted, with emendations, from: Burgess, G.H. 1991. Shark attack and the International Shark Attack File, pp. 101-105. In: Gruber, S.H. (ed.). 1990. Discovering Sharks, American Littoral Society, Highlands, New Jersey]. FLMNH.UFL.edu. IRIN, Humanitarian News and Analysis, a project of the UN Office for the Coordination of Humanitarian Affairs. (4 December 2008). “Madagascar: Too Few Sharks is a Bad Thing.” IRINNews.org. Sea Shepherd Conservation Society. (2009). “Defending Sharks.” SeaShepherd.org. Tobin, Barry, Australian Institute of Marine Science (2008). “Dangerous Marine Mammals of Northern Australia: Sharks.” AIMS.gov.au.